^ London (City) community profile. 2006 Census data. Statistics Canada. [15 February 2011]. ^ London (Census metropolitan area) community profile. 2006 Census data. Statistics Canada. [15 February 2011]. ^ 3.0 3.1 Population and dwelling counts, for Canada and census subdivisions (municipalities), 2011 and 2006 censuses. Statistics Canada, 2011 Census of Population. 2014-01-13 [2014-03-28]. ^ 4.0 4.1 Population and dwelling counts, for Canada, census metropolitan areas, census agglomerations and census subdivisions (municipalities), 2011 and 2006 censuses. Statistics Canada, 2011 Census of Population. 2014-01-13 [2014-03-28]. ^ 5.0 5.1 London (City) community profile. 2011 Census data. Statistics Canada. [8 February 2012]. ^ St-Denis, Guy. Byron:Pioneer Days in Westminster Township. Crinklaw Press. 1985: 21–22. ISBN 0-919939-10-4. ^ Adam, Graeme Mercer; Mulvany, Charles Pelham; Robinson,Christopher Blackett. History of Toronto and County of York, Ontario: Containing an Outline of the History of the Dominion of Canada; a History of the City of Toronto and the County of York, with the Townships, Towns, General and Local Statistics; Biographical Sketches (Part II: The County of York) 1. C.B. Robinson. 1885: 9. ^ Spelt, J. 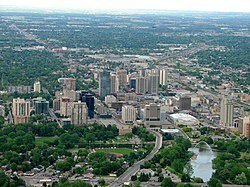 Urban development in south-central Ontario. McClelland and Stewart. 1972. ^ 11.0 11.1 11.2 11.3 11.4 The beginnings. City of London. 2009 [24 September 2009]. （原始内容存档于2010年11月25日）. ^ Event Highlights for the City of London 1793–1843. City of London. [24 September 2009]. （原始内容存档于2010年12月18日）. ^ Event Highlights for the City of London 1844–1894. City of London. [24 September 2009]. （原始内容存档于2010年12月18日）. ^ Adams, Bill. The History of the London Fire Department of heroes, helmets and hoses 1st. London Fire Department. 2002: 13. ISBN 0-9732159-0-9. ^ Getting to London. LEDC. 2006 [27 September 2009]. （原始内容存档于2008年5月3日）. ^ Ontario government improving Highway 402 between London and Sarnia. Government of Ontario. 2009 [27 September 2009]. （原始内容存档于2009年6月30日）. ^ Bevers, Cameron. The King's Highway 403. 2002 [27 September 2009]. ^ Routes and Schedules. London Transit Commission. [27 September 2009]. ^ 19.0 19.1 19.2 Transportation. London Economic Development Corporation. 2006 [28 September 2009]. （原始内容存档于2007年8月9日）. ^ Train routes to/from London. Via Rail. [28 September 2009]. ^ Airlines and Tour Operators. London International Airport. [19 February 2011]. （原始内容存档于2011年3月4日）. ^ Atlas of Canada - Weather. Natural Resources Canada. 2009 [24 September 2009]. （原始内容存档于2010年3月23日）. ^ 23.0 23.1 Canadian Climate Normals. Environment Canada. April 2009 [25 September 2009]. ^ Canadian Climate Normals 1971–2000. 加拿大環境部. [24 March 2012].